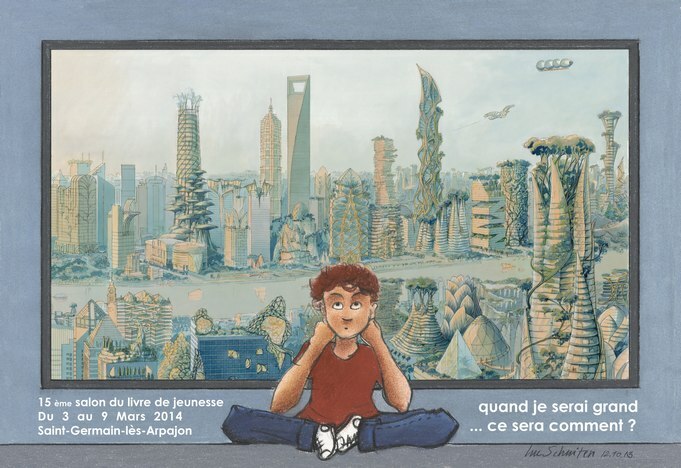 The 15th Salon du livre de jeunesse will be held from March 3 till 9, 2014 in Saint Germain Les Arpajon. Luc Schuiten is the guest of honor. His “Vegetal City” exposition can been visited the whole week during the event. On Friday March 7th, François Schuiten, Benoît Peeters and Bruno Letort will do the lecture “Souvenirs de l'éternel présent”. After the lecture there will be a possibility to get your books signed. Read the festival brochure with all the details. This blog post was created on 2014-01-30 at 15:32 and last modified on 2018-05-06 at 08:40 by Joseph Le Perdriel.